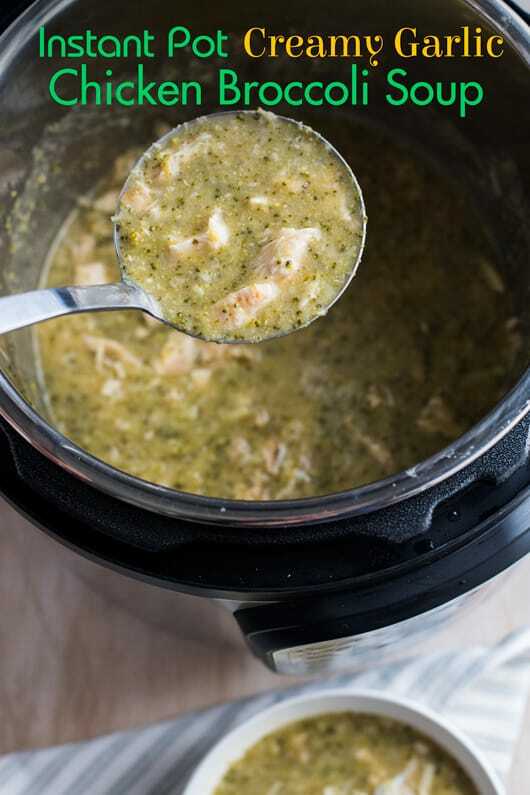 We’re really obsessed with our Instant Pot recipes and pressure cooking for so many reasons and last week we took our popular creamy garlic chicken with broccoli recipe and made a soup out of it. It was outstanding and a hit! 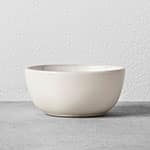 Wow, this soup is so good. 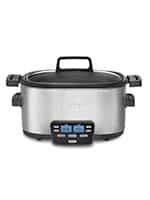 First of all, one of the reasons we love cooking with out Instant Pot pressure cooker is because the cooking is so quick. 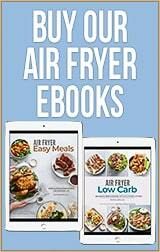 So many folks think that such quick cooking doesn’t produce good tasing food and that’s not true. 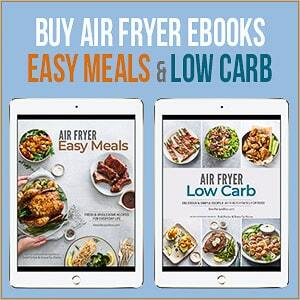 You can cook with frozen meat and it comes out great! 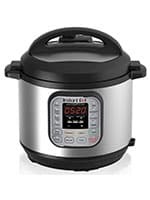 With the instant pot, the saute function allows us to sear and cook ingredients to bring out it’s full flavor before it’s pressure cooking. Yes, it’s truly a versatile cooking tool. This soup is made in less than 25 minutes and that includes the time to build up pressure in the Instant Pot. 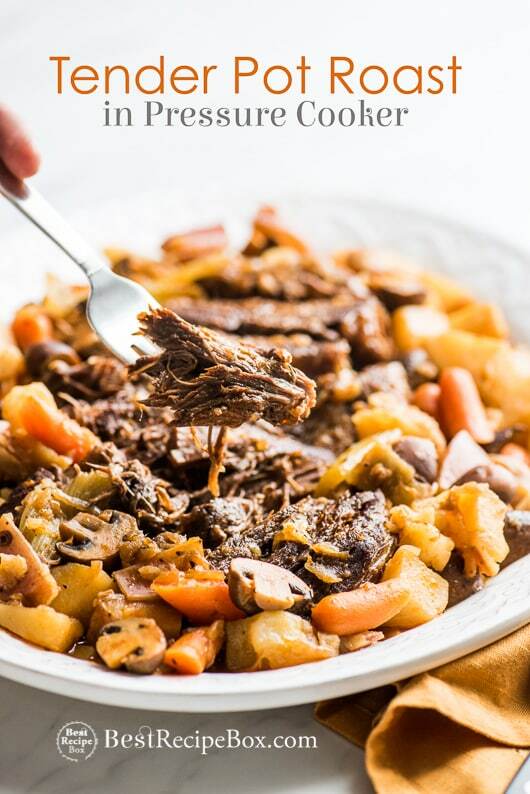 Second reason why we love recipes in the Instant Pot is because the flavors are fantastic. 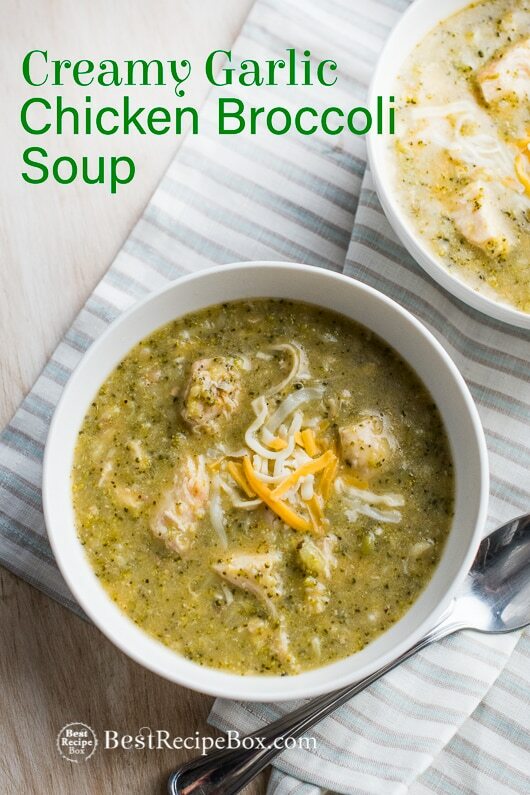 The pressure really allows this flavors in this creamy garlic chicken soup with broccoli to produce outstanding flavor. 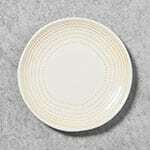 The texture is also amazing and the chicken is tender, juicy and wonderful. The test kitchen devoured this creamy garlic chicken broccoli soup recipe and served it with some crusty bread. 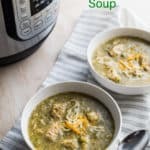 It’s a great Instant Pot Broccoli Cheese chicken soup. 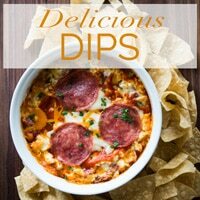 Some members ate it with crackers and either way, it was definitely a surprise favorite because it’s so easy. 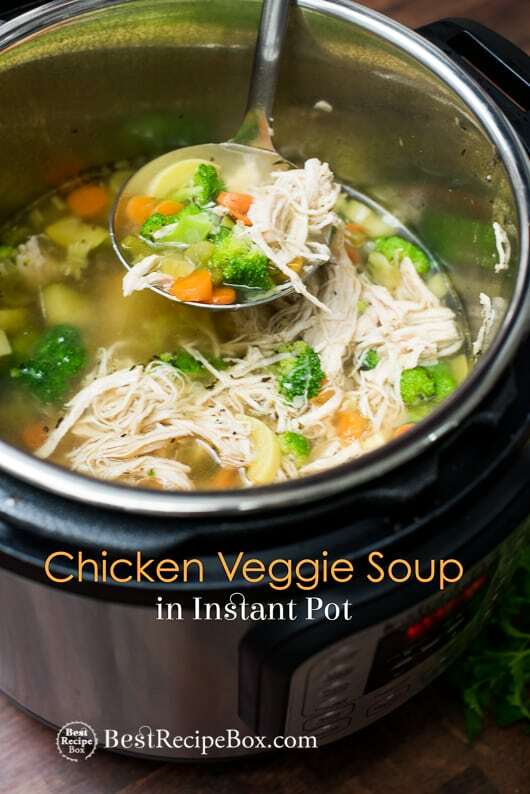 It’s the perfect Instant pot chicken soup recipe to make during those busy weeknights when you want to get dinner on the table quick. 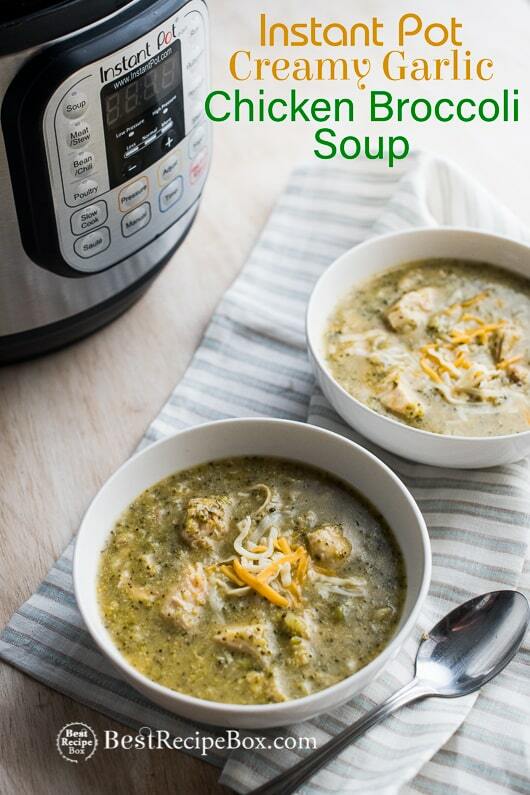 Just prep your ingredients ahead of time and when you’re ready to cook, just throw everything in the instant pot and you have an instant chicken broccoli soup dinner. You can also make this into a slow cooker chicken broccoli soup recipe. 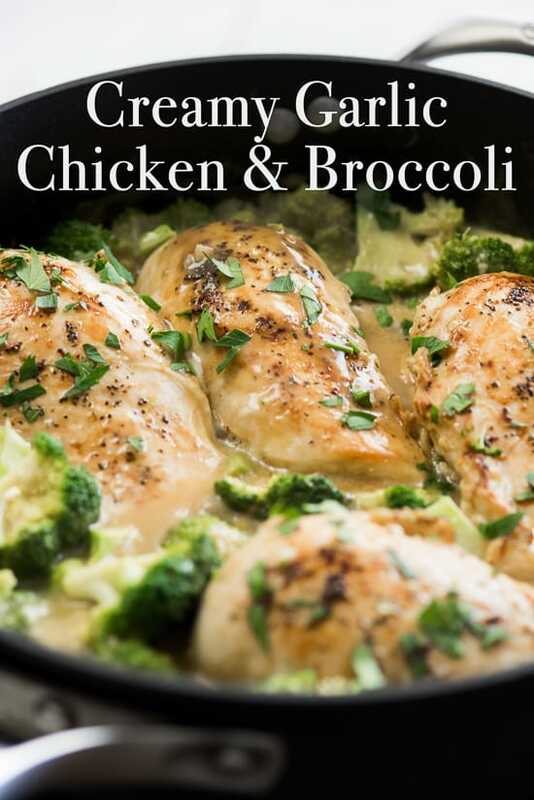 The creamy flavor and tender chicken with broccoli is definitely a favorite for kids too. It’s a great way to have them devour their broccoli! You’ll love this wonderful potato soup recipe too if you’re soup addicts like we are! 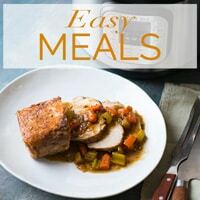 Click Here for —>More Instant Pot Recipes! 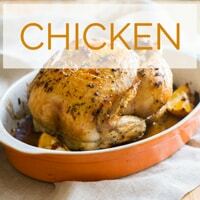 We used chicken breast for the recipe, but it can easily be made with chicken thighs or legs. 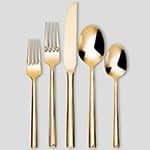 Thickness of chicken breast will vary so you will have to increase cooking times if your chicken breast is thick. If you are using chicken tenders, cooking time will be less. Turn Instant Pot on "Sauté”. Melt the butter. Add the chicken and each side until the chicken is lightly browned. 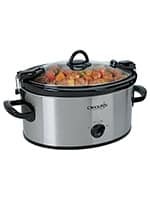 Remove chicken from Instant Pot, cover and keep warm. Add the garlic and cook until garlic is lightly brown and fragrant. Whisk in the condensed cream of chicken soup and water. Remove all lumps in the liquid. Remove the chicken from the soup and cut or shred into pieces. Return the chicken to the soup. Garnish with optional cheese and/or sour cream. I wasn’t expecting too much from this recipe. Had all the ingredients and thought I’d give it a try. Wow! So much flavor and amazing. Will be making this easy recipe again and again! It’s not the prettiest looking soup but it sure is tasty and delish! This is a great way to get the kids to eat broccoli! They absolutely love this soup. 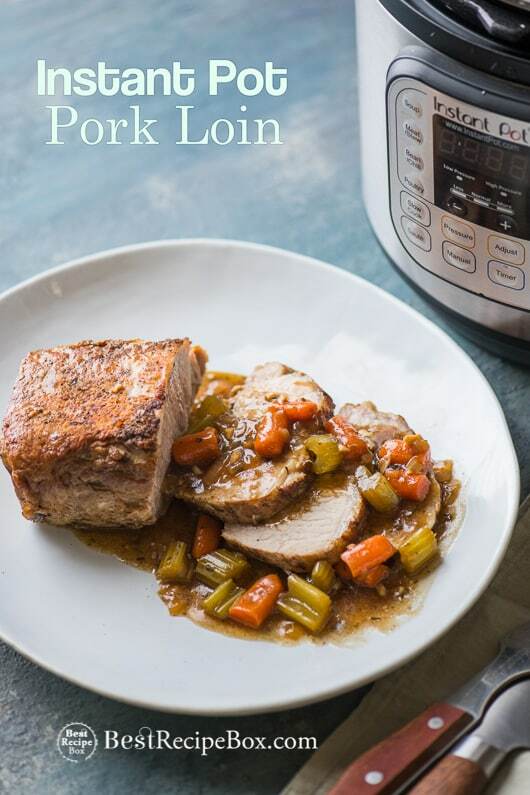 I can’t believe how easy it is to just pop it in the instant pot. Right on! 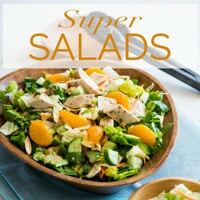 This is a great recipe that kids love. 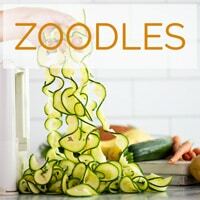 I added garlic croutons on top and this soup was crazy delicious and easy! Love the addition of garlic croutons! This is like a crazy good broccoli cheese soup with chicken. Add some sourdough bread it was dinner! It’s definitely addicting! You can’t go wrong with chicken added to creamy broccoli cheese soup.